Great synopsis, Chris. Has the Canadian Navy said whether or not the impulsive sounds recorded minutes before the sonar pings were first heard were in any way related to the Ottawa’s training exercise? Also, let’s not forget to ask both Navies whether or not they generated any sounds along the U.S. or B.C. Pacific Coast during late January and the first two weeks of February. Until those impulsive sounds heard in inland waters are determined to be unrelated to military activities, I think the extensive trauma L-112 suffered should motivate us to ask about any underwater detonations that may have occurred on the outer coast. — offers some clarity about L-112’s relatives and her importance in the demographics of L pod. Thanks, Scott. As you know, I’ve inquired about the explosive sounds just before the sonar commenced. And, at your suggestion, I’ve extended the inquiry to the weeks before the Navy’s exercise. As you’ve mentioned to me, there could be some alternate explanations for the sound. I will continue to pursue this, but I did not want to delay this blog post any longer. While I’m at it, I want to thank you again, Scott, for your continuing efforts to piece together the disparate information from the world of underwater sound. Sonar is always seems the first thing blamed when a whale washes ashore. 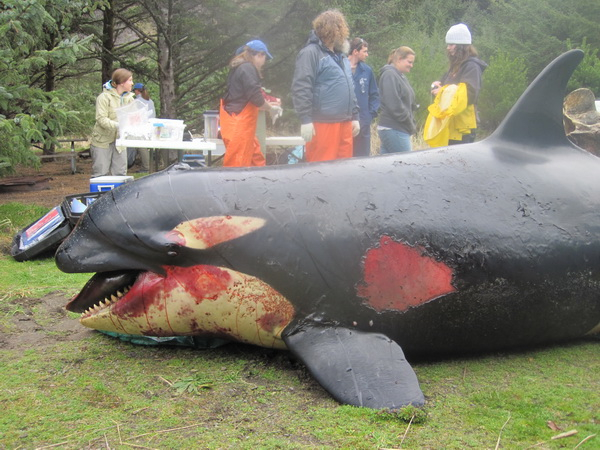 Orca Network, Seattle Times … sonar is in headlines although no investigation or analysis has been conducted. Sonar might be involved, but sonar doesn’t do to a whale what is visible in the photograph. Hundreds of whales (and other water mammals) have historically been recorded washing ashore in the United States. Those records go back pre-Civil War, and sonar wasn’t invented until 1918. The not too distant USS SHOUP accusations of Navy sonar being responsible for Straits of Juan de Fuca porpoise deaths didn’t stand up to scientific and investigative scrutiny. Good article. Let’s see what the investigations and science reveals.